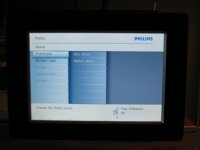 I shouldn't look a gift digital frame in the interface, but it contributed to a badly spent Labor Day, so I will: the Philips 7FF2M4. 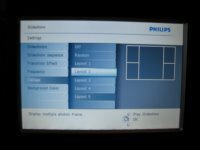 In February I posted a link to David Pogue's review of other digital frame designs that mostly got it all wrong; consider this a detailed sequel from yours truly. It will play a slideshow of all the pictures on the card. Physically it's a nice frame, with a solid plugin foot that's heavy enough to hurt someone. I think it's a 7x5" display, although that's a bit vague on the box. 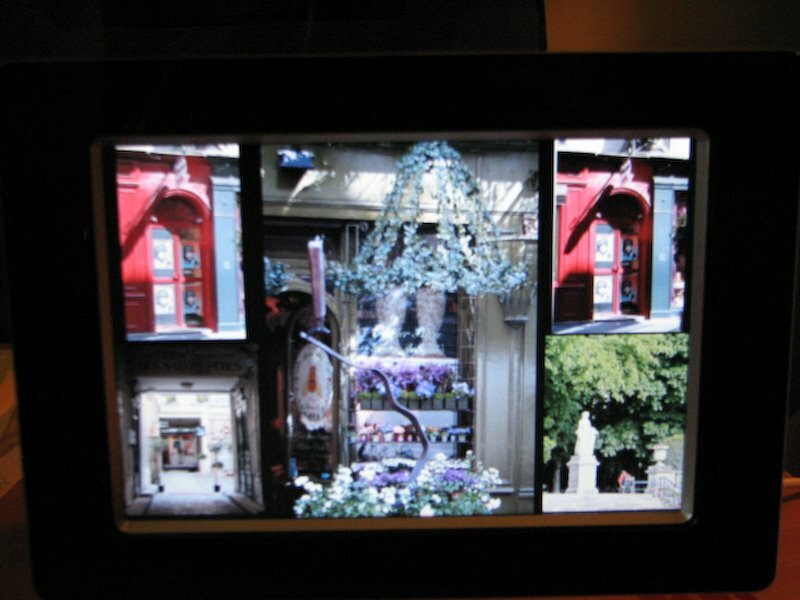 It claims to do auto-rotation, to landscape or horizontal, which is nice - I remember that my smarter cameras know to rotate pics, but not all do, so my cards from my cameras might not work well "as is." Okay, I'm not averse to dragging pics onto the card from a computer. Which I do, and then stick it in the frame. 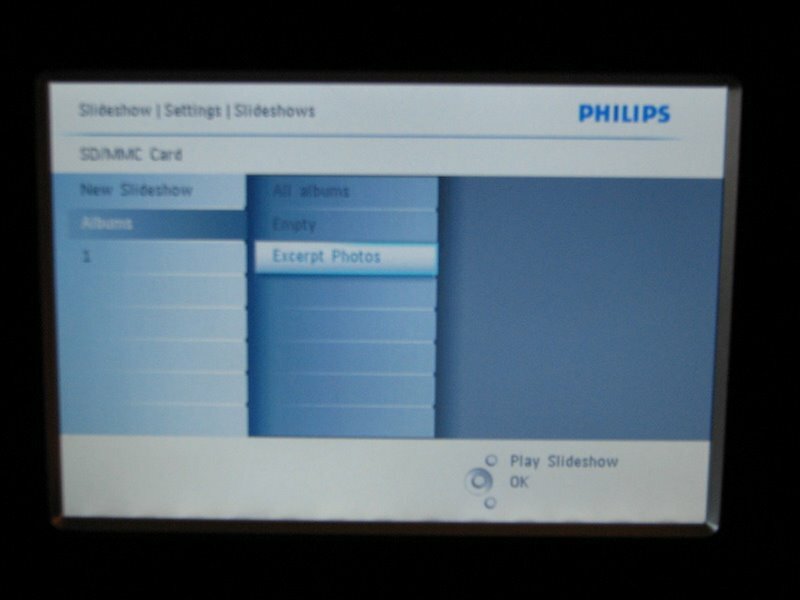 It does not play anything automatically except its own menu - and when I find the slideshow button (I do like the physical controls on the back) I try to play it. 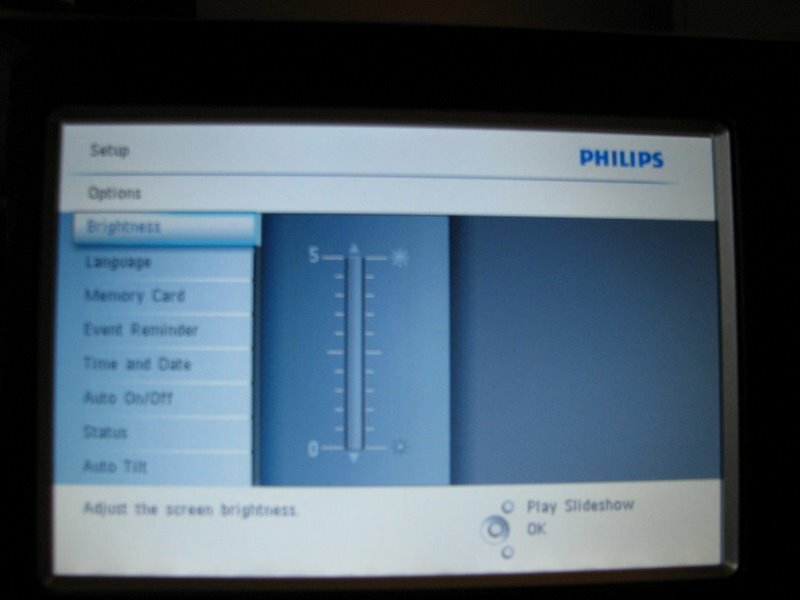 But it plays some generic Philips ads, not my pictures. What? I find the settings to choose another collage and it sure has a lot of them. Sheesh. The only one I really would consider using in a small frame size is 2-up, a split screen of 2 images, and that setting is NOT offered. But the kicker is this: None of my choices stick. 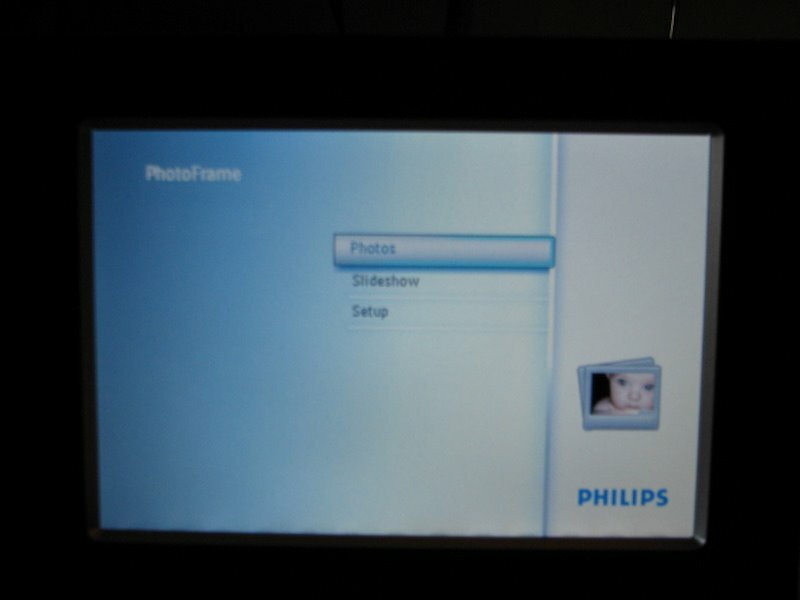 When I power down and restart it next morning, it's back to playing the Philips internal frame memory, and using a collage of 5 pictures. What the heck? With all those menus to go through, it requires some real work to get it into a state without too much setup time. 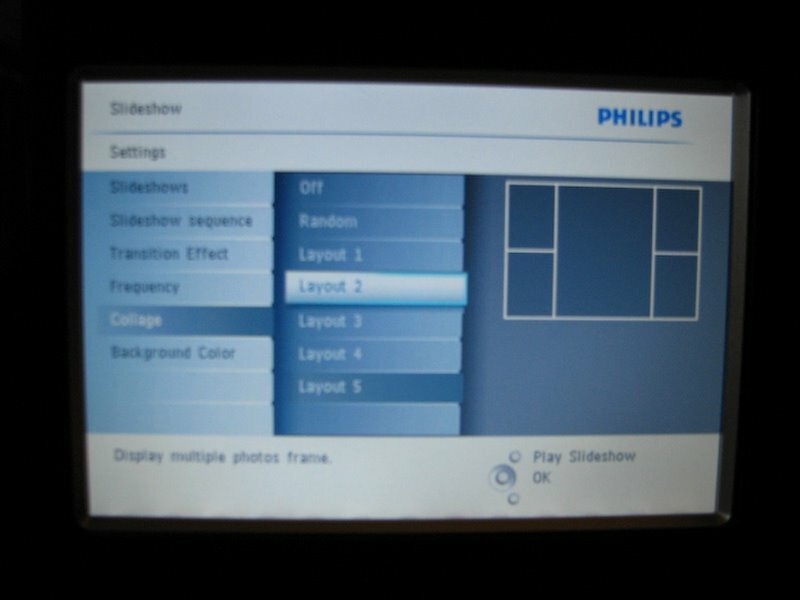 I managed to erase the Philips frame pictures so when I hit slideshow it finds mine, but have not figured out how to get it to remember the collage style I prefer. I realize the market is crowded with digital frames, but I suspect we are not really ready for complex feature wars yet. Ease of use out of the box seems like the most important aspect here. The task of playing photos (with simple defaults - dissolve and no collage mode, remember last directory played from) is not rocket science. 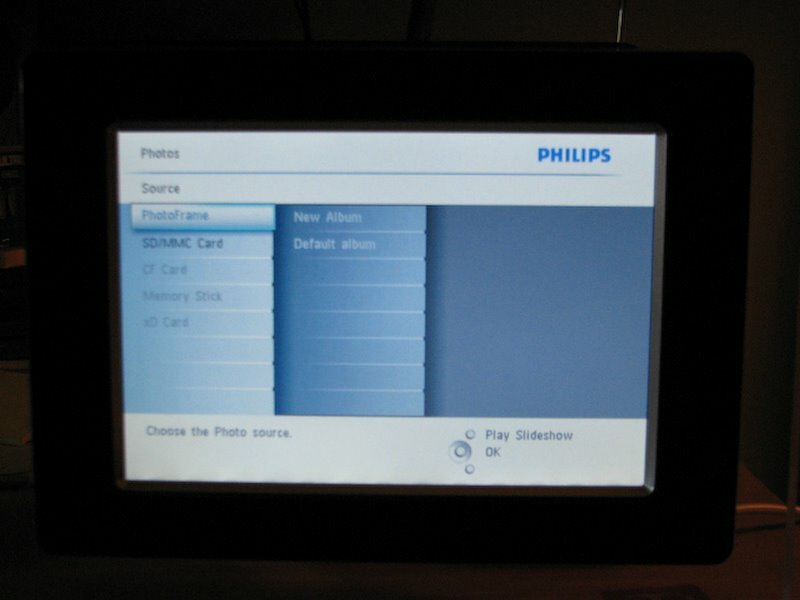 Okay, there may be some clever design required for cases with multiple directories of photos embedded in a frame, but some code that FINDS THE PHOTOS instead of requiring the user to navigate through strange DCAM directories would seem doable. A very simple startup option in the case of multiple directories would seem doable too - which one do you want to play now? Let's assume for jollies that it's probably the card contents that should be the default, not the internal frame's limited memory. There are multiple photo directories. What do you want to see? 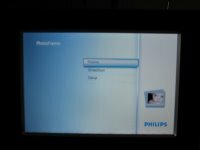 One Philips frame review at CNET says the next model is an improvement for ease of use. Our biggest complaint about the 7FF was that the unit wasn't a little more intuitive to navigate right out of the box. Although it didn't take us that long to figure things out, the unit's internal GUI (graphical user interface) could have been a little more user-friendly. 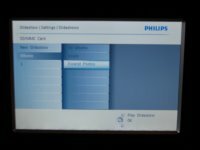 Philips seems to have gone out of its way to fix that problem in this next-generation model with a totally redesigned interface. I sure hope so. I admit I doubt they get as close as my suggestion above... but I'd be pleasantly surprised if so.